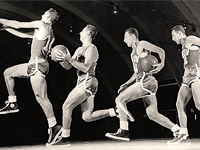 Bob “Houdini of the Hardwood” Cousy is one of the players who could be credited with inventing the fast break back in the 1950s. The Celtics’ strategy was to rely on Bill Russell’s rebounding and help defense (nicknamed the “Hey Bill” defense) to get the ball and immediately pass it to Cousy, who was already on the way to the opposite rim. A big reason why Cousy was able to stand out like that was coach Red Auerbach, who was much less conservative than other coaches of the time period and let Cousy do his thing and play improv, as opposed to running set plays. “i didn’t care who he passed to”, said Auerbach “as long as someone caught it”.